Building and ventilation design that affect how air and pollutants get inside, move through, and exit a building. What are sources of indoor pollutants? Sources of indoor air quality contaminants can originate from both outside and inside a building. Outdoor air pollutants, odors, water/water vapor, and radon can enter a building through open windows or cracks in the structure. Indoor air quality is more often affected by materials found inside a building. Typical pollutant sources within buildings include cleaning and personal care products, pesticides, building materials and furnishings, chemicals off-gassing from furnishings, products created from fuel-burning equipment (e.g. carbon monoxide), and excess moisture. Other building conditions like higher temperatures and humidity can also increase pollutant concentrations. What are common indoor pollutants? Some common indoor air pollutant concerns include the following. Click the + sign to expand and learn more about these topics. Tobacco Smoke or Secondhand smoke is produced from burning cigarettes, cigars, pipes, or hookah, as well as smoke breathed out by a person smoking a tobacco product. In infants and children, tobacco smoke is associated with more frequent and severe asthma attacks, respiratory infections, ear infections, and sudden infant death syndrome (SIDS). In adults, health conditions associated with tobacco smoke include coronary heart disease, stroke, and 12 different types of cancer ranging from lung and bronchus cancer to bladder and pancreatic cancer. Create a smoke-free environment at home, school, and workplace. Decrease personal and secondhand smoke exposure by stopping tobacco use. Radon is a naturally occurring gas produced from the breakdown of uranium and radium in soil and rock found all across Massachusetts. It can enter into a home or building through cracks, joints, cavities, and gaps in building floors and walls. Radon gas can accumulate within a home or building. Radon gas breaks down into radioactive particles that can be breathed into the lungs and damage lung tissue. Continued exposure to high levels of radon gas over time can increase the risk of lung cancer. Radon is the leading cause of lung cancer in people who never smoke, and the second leading cause of lung cancer overall. For people who smoke, tobacco use and radon exposure work together to increase the risk of developing lung cancer up to 10 times greater than the risk to people who have never smoked. Test your home to find out if you have radon. Contact the Massachusetts Radon Assessment Unit at 1-800-RADON-95 (1-800-723-6695) if you have questions about radon. The US Environmental Protection Agency (US EPA) has developed a number of other practical resources for homeowners, renters, prospective homebuyers, and builders on its website. Combustion contaminants (carbon monoxide, nitrogen dioxide, fine particulate matter) are released when burning fuels such as oil, natural gas, kerosene, and wood. Indoor air quality can be affected when gas stoves, kerosene or gas heaters, chimneys, furnaces, or generators are not working properly or not vented outdoors to prevent contaminant build up. Automobile exhaust in attached garages can also enter living spaces. These and other contaminants can also enter a building from the outdoors. Carbon monoxide is a colorless, odorless gas that reduces the amount of oxygen carried in the blood, which can lead to headaches and flu-like symptoms such as dizziness, shortness of breath, and nausea. Nitrogen dioxide is a colorless, odorless gas that causes irritation of the eyes, nose, and throat and increases the risk of respiratory infections. Fine particulate matter or PM2.5 are microscopic airborne particles that can travel deep into the lungs. For many individuals, exposure to PM2.5 can cause irritation of the eyes, nose, throat, and lungs; coughing; sneezing; runny nose; and shortness of breath. PM2.5 can worsen medical conditions such as asthma and heart disease. Use a stovetop hood or exhaust fan in the kitchen when cooking to reduce exposure to combustion products. Have a qualified service technician inspect your appliances before the heating season every year. Check vent pipes, flues, and chimneys for leaks or blockages that can prevent combustion from escaping. Prevent snow, ice, and debris from blocking exhaust pipes of cars and heating equipment. Do not use generators indoors, including garages. Place a carbon monoxide detector approved by an independent testing company such as Underwriters’ Laboratories (UL) on every level of your home, except unfinished basements or attics. Additional carbon monoxide safety tips are available here. Volatile Organic Compounds (VOCs) are chemicals that are found in household and commercial products, as well as building materials. 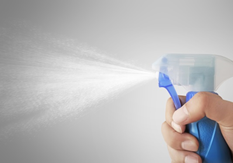 Common sources of VOCs include cleaners, deodorizers, paints, personal care products, furniture polishes, and dry-cleaned goods. Benzene a slightly sweet smelling chemical that is released into the air when glues, paints, furniture wax, and detergents are used or when tobacco is lit. Formaldehyde is a colorless gas with a slight pungent smell. It is primarily released, or off-gassed, into the air from pressed wood products (e.g. particle board, laminate), furniture, carpets, and permanent press fabrics. Toluene is a solvent that gets into the air when a person uses paints, paint thinners, fingernail polish, lacquers, and adhesives. Breathing benzene can cause drowsiness, dizziness, rapid heart rate, and unconsciousness. Long-term exposure to benzene has major effects on blood. Over time, benzene is harmful to bone marrow and can cause anemia and leukemia. Formaldehyde can cause irritation of eyes and the respiratory system, and continued exposure can cause severe allergic reactions of the skin and eyes. It is also recognized as a cancer-causing agent. Products containing VOCs, including benzene, formaldehyde, and toluene, should be used in a well ventilated area. Open windows and exhaust ventilation can help dilute and remove these chemicals. Limit the use of scented products, including candles, which contain fragrance chemicals. When not in use, VOC-containing products should be tightly covered to prevent evaporation into the air. Consider cleaning products and furniture polishes that contain no/low VOCs or use home care products that have safer ingredients. The U.S. Environmental Protection Agency maintains a list of Safer Choice products considered safer for people and the environment. Wash permanent-press clothing and curtains before using them. Let new products release formaldehyde outside of your living space (e.g. patio or garage) before using or installing the items indoors. Opening windows to increase fresh air in a home or building is the best way to reduce buildup of indoor air contaminants. Testing for chemicals in the air of a home is not usually necessary and has drawbacks including cost, test reliability and interpretability, and difficulty of identifying specific chemical sources, since many products contain similar ingredients. Contaminants disturbed during renovations include dusts and certain hazardous materials that can become airborne when disturbed during remodeling, renovation, weatherization, or energy efficiency projects. In older buildings, an added concern includes lead dust and asbestos fibers. Prior to remodeling or renovating a home or property, determine the age of the property, history of renovations or changes made to the building, and whether relevant lead or asbestos reports exist. Lead paint was commonly used in buildings constructed before 1978. Although lead paint is no longer used, remodeling activities can disturb lead-containing paint previously sealed under other paint layers. Lead was also used in plumbing before 1986, so water can also contain lead. Asbestos is a naturally occurring fibrous particle that is resistant to heat, fire, and many caustic chemicals. It was used in decorative plasters, fireproofing, flooring tiles, heating system insulation, joint compound, mastics, roofing, siding, vinyl sheet flooring, some vermiculite-containing materials, and wallboard. Lead is harmful to the brain, kidneys, and nervous system of children. There is no safe level of lead. Even at low levels, lead can make it hard for children to learn, pay attention, and behave. Because lead poisoning often occurs with no obvious symptoms, it often goes unrecognized. Breathing in high levels of asbestos can cause scarring of the lung and the lining of the lung. Exposure to asbestos can also cause lung cancer and mesothelioma, another type of cancer. It is important to note that asbestos-containing materials (ACM) that are in good condition (e.g. not damaged or disturbed) are not likely to pose a health risk. If you suspect lead paint in your home, take action. Research your home in a database of previous residential lead inspections maintained by the Massachusetts Childhood Lead Poisoning Prevention Program (CLPPP). If you rent your home, ask your property owner if the home was inspected. If you have a child under 6, you can call your local health department or CLPPP at (800) 532-9571 and ask for an inspection. If you own your home, contact a licensed lead inspector to test your home. Homeowners can also perform low-risk deleading. Repair and removal of asbestos must be done in accordance with all MA Department of Environmental Protection (DEP) and Department of Labor Standards (DLS) asbestos regulations. A searchable database for asbestos projects can be found here. For renters, contact the health agent at your local board of health to report or determine if there is an asbestos concern in your home. For homeowners who have asbestos concerns, contact your regional MA DEP office for help. Schools are required to maintain asbestos containing materials in good condition, in accordance with the Asbestos Hazard Emergency Response Act (AHERA). This includes identifying asbestos-containing materials, development of a management plan, re-inspections, performing response actions, and recordkeeping requirements. Contact the MA Asbestos Program at (617) 626-6030 if you have questions about a school’s AHERA report. Most pesticide exposures occur when the product is inhaled. However, pesticides can also be absorbed through the skin or accidentally ingested. More immediate symptoms from pesticides typically include irritation to eye, nose, and throat. Long-term and consistent exposures can lead to damage to the central nervous system and kidneys and an increased risk of cancer. Keep food containers and bags tightly sealed, and eliminate crumbs through frequent cleaning of counters, floors, food cupboards, and garbage areas. Repair water leaks, replace water-damaged materials, prevent standing water in planters, and reduce humidity to avoid attracting pests. Seal cracks and crevices around pipes and gaps in doors to prevent pest entry. Holes as small as ¼ inch are enough space for rodents to enter a building. If insecticide use cannot be avoided, consider using non-aerosol options such as gels and solids rather than sprays or foggers. Look for safer pesticides, such as boric acid and pyrethrins (a type pesticide made from chrysanthemum flowers). Use cleaning products that contain safer ingredients. The U.S. Environmental Protection Agency has a list of products that meet their Safer Choice standard. Excess moisture and humidity or dampness in a building is associated with biological pollutants, such as mold and bacterial growth, pests, and dust mites. Dampness is also associated with the release of chemicals in furniture and building materials Water damage in a building can be caused by floods, leaks, or humid air coming into the building from the outside. Pipe leaks from within a building, as well as common activities such as cooking, clothing or dish washing, and bathing can also contribute to moisture indoors. Mold growth occurs in the indoor environment, when mold spores come in contact with wet or water-damaged building materials or furnishings. Mold can grow on absorbent or porous materials (e.g. insulation, carpets, gypsum wallboards). Sometimes mold will grow on the surface of hard or non-porous surfaces (e.g. plastic, metal, glass). Damp environments are attractive to pests, such as rodents and cockroaches. Similarly, high humidity conditions can cause dust mites to thrive in bedding, upholstered furniture, and carpets. Biological pollutants, including molds, pests, and dust mites, are irritants that also produce allergens or substances that can cause allergic reactions. Common irritant responses include runny nose, sneezing, itchy or red eyes, and skin irritation. Exposure to biological pollutants can exacerbate pre-existing conditions, such as asthma or allergies. Some populations, including infants and children, elderly people, and immunocompromised patients, are more likely to experience allergy symptoms or more severe reactions because they are more susceptible to biological contaminants. Reduce indoor humidity by using kitchen and bathroom exhaust vents Dry wet building materials and furnishings completely within 24-48 hours of damage. Paper-based or drywall may need to be removed if it cannot be dried completely. Clean or scrub hard surfaces such as plastic, metal, or tile after material is dry. Refer to resources offered by the US Environmental Protection Agency (US EPA). Resources are available for homeowners, school and building managers, and health professionals. If you rent your home, you should contact your landlord or building manager to address leaks, dampness, or other Sanitary Code concerns. If a landlord does not respond to a tenant’s complaints about a Sanitary Code violation, you may request that the local board of health inspect the apartment. In addition to moisture control, follow steps for integrated pest management to avoid attracting pests. What are strategies for improving indoor air quality? When these practices are put in place, common symptoms associated with poor air quality can be avoided. For more information on these indoor air quality topics, see sections on ventilation, moisture, and irritant sources. What symptoms are associated with indoor air pollution? Without fresh air ventilation and removal of stale air to the outdoors, indoor pollutants tend to accumulate. Symptoms commonly associated with poor air circulation and short-term exposure to indoor air pollutants include respiratory symptoms such as coughing, stuffy nose, itchy eyes, and sore throat, as well as headaches and fatigue. These symptoms can also be associated with other indoor environmental factors, such as noise and poor lighting. Building occupants most commonly report temperature and comfort issues. Some people with chronic respiratory conditions, such as asthma, are more likely to experience health symptoms associated with dusts and molds, including allergic reactions and respiratory irritation. Controlling moisture is the key to preventing mold growth and potential health impacts. In schools, chronic aggravation of asthma and other respiratory illnesses can result in higher rates of school absenteeism. A number of studies have found that inadequate ventilation ultimately results in decreased learning and performance. Long-term exposures to some indoor air pollutants can have more serious health effects including respiratory disease, heart disease, cancer, and damage to other systems in the body. For example, cigarette smoke, radon, asbestos, and formaldehyde are cancer-causing agents. Lead dust from chipping, peeling, or loose paint or disturbed during renovations is known to cause brain and kidney damage and behavioral and learning problems, particularly in children who absorb led more easily than adults. Even low levels of lead are harmful to the health of a child. What do I do if I have an IAQ concern? Opening windows to let in fresh air and/or use exhaust fans or window fans to draw air out of a room. The latter is recommended for those who experience allergies or asthma. For people who live near highways, using a fan to draw air out of a room will reduce exposures to pollens and pollutants from vehicles. Cleaning often to get rid of dust, pet fur, and other allergens. Wet wiping and damp mopping or using vacuums equipped with a HEPA filter are better than sweeping or feather dusting. Using cleaning products that contain safer ingredients. The U.S. Environmental Protection Agency maintains a list of Safer Choice products considered safer for people and the environment. Controlling moisture to prevent mold growth. Use kitchen and bathroom ventilation to remove excess moisture. A dehumidifier can also be used to reduce humidity. Preventing pests such as mice and insects by implementing integrated pest management, which includes practices that remove conditions that attract pests. If you have specific indoor air related questions, refer to the What are common indoor pollutants? section above for contact information. While many of the actions above can be taken by most people, it should be noted that people who rent homes may not have the same opportunities to improve on housing conditions. Racial redlining and historical housing policies have created areas where there is housing stock that have conditions that lead to poor indoor environmental conditions that can exacerbate asthma symptoms or lead to other health outcomes. This housing stock is disproportionately used by communities of color and low resourced families. However, families can work with landlords to improve these conditions by reporting their concerns to local health departments. For people who rent, a housing code exists to ensure that the health, safety, and well-being of the tenants. The code, known as the State Sanitary Code (105 CMR 410) is enforced by local boards of health or health departments (Note: In Boston, it is the Housing Inspection Department.) The Massachusetts Department of Public Health’s Community Sanitation Program also has guidance on understanding the housing code, legal remedies for renters, and bed bugs. Indoor air quality concerns commonly arise in public buildings, such as schools, town halls, and libraries. The Massachusetts Department of Public Health’s (MDPH) Indoor Air Quality Program provides assistance and conducts indoor air quality assessments of public schools and buildings throughout Massachusetts. During these evaluations, staff collect measurements and observations about the building’s ventilation equipment, integrity of the building’s exterior components, water damage, and the sources of pollutants contributing to the indoor air quality. Reports on public buildings, including schools, that have been evaluated by the Indoor Air Quality Program within the MDPH’s Bureau of Environmental Health are available here. Public schools interested in an indoor air quality assessment can contact Indoor Air Quality Program staff at (617) 624-5757. The Indoor Air Quality Program also develops guidance documents for topic areas such as Indoor Air Quality in Schools: A Primer for Teacher, use of fragrances in the indoor environment, and maintenance of plants.